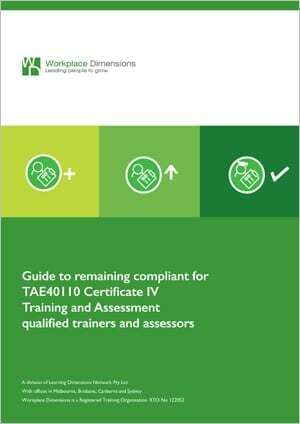 For TAE40110 Certificate IV Training and Assessment qualified trainers and assessors. Did you know that changes to the Standards for RTO’s mean all trainers and assessors qualified under the TAE40110 qualification need to meet new credential requirements by July 1, 2019? These changes are to improve the quality of training and assessment across the VET sector and all trainer and assessors must have the two required units on their qualification by July 1, 2019. Without meeting these requirements, a trainer and assessor will no longer be able to deliver training or make assessment judgements. Our public program training division Workplace Dimensions, with our partner MRWED Training And Assessment offer you options to either add to your existing qualification, or upgrade to the new qualification. We also offer this program in-house for organisations. Here are your options to meeting the new credential requirements for trainers and assessors. Completing these units below and providing evidence to your RTO is enough to ensure you can continue delivering/assessing in 2019. You do not need to upgrade to the new qualification. On the successful completion of each unit, you will be issued a statement of attainment to show your compliance. 7 million Australians struggle with the level of literacy skills required to meet the demands of everyday life and work? This 1-day program has been designed to support VET trainers address these alarming statistics. Learn how to access specialist support as required to support your learners. This program runs face-to-face to ensure the best outcome, support of coaches and a committed peer group. You may be able to complete the assessments during the sessions with some pre-work and homework done after hours. Cost – $350 per person. Includes 1 day face-to-face training, workbook, resource guide, ongoing coaching and assessment support. This 2-day program is for experienced practitioners who develop, deliver and/or assess vocational education and training, and design and create assessment tools for VET qualifications. Trainers will leave equipped with the skills and knowledge to design and assess the quality evidence gathered by an assessor including a student’s application in summative, formative and recognition of prior learning (RPL) assessment. Cost – $650 per person. Includes 2 days face-to-face training, workbook, resource guide, ongoing coaching and assessment support. Note: This program is delivered in partnership between Workplace Dimensions (RTO 122052) with MRWED (RTO 30146). 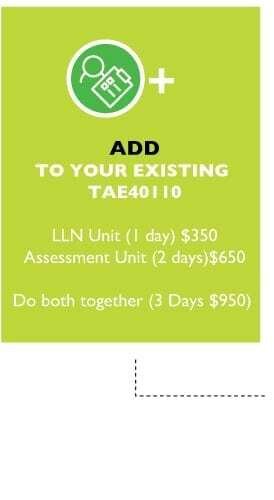 Your enrolment, Statement of Attainment or Certificate will formally be issued via our partner MRWED for the unit TAEASS502 Design and Develop Assessment Tools and the qualification TAE40116 Certificate IV in Training and Assessment, however, you will be trained and assessed by Workplace Dimensions. Single unit TAELLN411 Language Literacy and Numeracy will be issued by Workplace Dimensions. Includes 3 days face-to-face training, workbook, resource guide, ongoing coaching and assessment support. 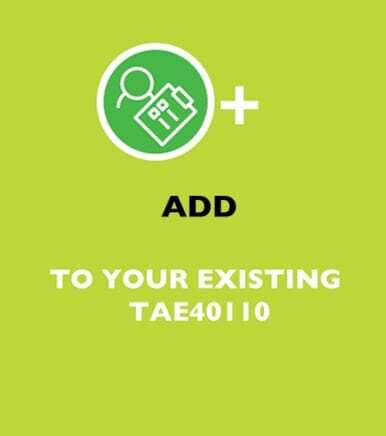 Note: If you completed your TAE40110 with Workplace Dimensions, you will already have completed TAELLN411 Address Adult Language Literacy and Numeracy, so will only need to do TAEASS502 Design and Develop Assessment Tools. If you did your qualification with another training provider – check your academic statement to see if you already hold either of the required units. Those units with A or B on the end are equivalent. READY TO TAKE UP THIS OPTION AND ADD TO YOUR CURRENT QUALIFICATION TO STAY COMPLIANT? 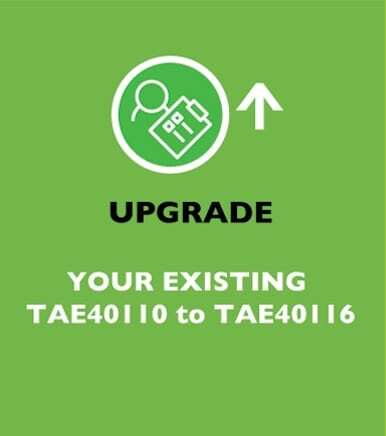 You may choose to upgrade to the current TAE40116 Certificate in Training and Assessment qualification. You will need to undertake the two required units below plus complete an RPL process. You will then be issued the new TAE40116 Certificate IV in Training and Assessment. Because of the significant changes to the above two units, upgrading to the new qualification requires you to complete additional assessment tasks, or supply RPL evidence to demonstrate you have the required knowledge for each unit. Complete the two required unit/s (if you don’t already hold the units). Complete the Gap Assessment RPL kit we will provide you. This will guide you through the activities required for the gap assessment, to achieve these units and the upgrade of your qualification to TAE40116. Send back your Gap Assessment RPL kit. Once you are deemed competent, you will be issued the new TAE40116 Certificate IV in Training and Assessment qualification. READY TO TAKE UP THIS OPTION AND UPGRADE TO THE NEW QUALIFICATION? If you already hold a higher qualification in Adult Education, you are compliant and don’t need to do anything. Note this does not include qualifications like Bachelor of Education; your qualification needs to be specifically Adult Education/ VET focused. Master of Education or Doctoral degree with an Adult Education focus. If you don’t have a qualification and would like to be a VET Trainer and Assessor, you can do the full TAE40116 with our partner MRWED. Find out more here. We run this program in Melbourne, Brisbane, Canberra. WANT THIS PROGRAM DELIVERED FOR YOUR WORKPLACE? We can deliver this program for your people on-site, anywhere in Australia. Call us on 1300 453 555. Why choose us to deliver for your organisation? We work extensively with corporate clients and government departments around Australia. We can come to you and train your people in-house, Australia wide. Need something tailored to your industry? Yep, we can do that too. We train the way we know works best - face-to-face high impact training – our organisation has been engaging learners for 25 years. We handle the admin. We have online enrolments for easy booking and dedicated project managers who can work the logistics seamlessly with your organisational needs. By request (and with learners permission), we can provide statements and Certificates straight to your Compliance Manager so you’ll know everyone is who works for you is ASQA compliant. Don’t have enough for a group? Alternatively, for smaller numbers or individuals, we have public programs through our training divisions Workplace Dimensions that run regularly in major cities.